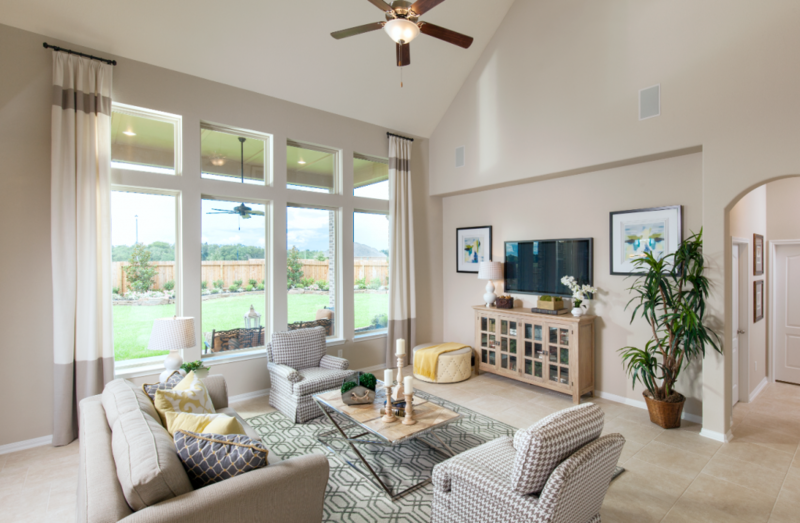 With one look at Plantation Homes spectacular model in our Dellrose community, you’ll forget every thought you’ve ever had about a traditional Texas-style home. Showcasing the builder’s stately Driftwood plan, the two-story model at 31306 Weathervane Trail in Hockley, Texas offers a stellar array of features guaranteed to elevate your family’s lifestyle. Casually elegant, the model invites you in with a colorful brick-and-stone elevation, gabled roof and mullioned windows. Fans of open floor plans will not be disappointed as the airy 3,200-square-foot open features a two-story family room that flows easily into an informal eating area and a gorgeous kitchen where recessed lighting washes over the granite-topped island and gleaming GE® stainless steel appliances. Demonstrating the range of options available, the builder has equipped the backyard with an all-brick Texas-sized covered patio where guests can enjoy al fresco dining courtesy of an outdoor kitchen. An optional media room enhances the game room, creating an indoor playground your entire family will love. The Driftwood is one of 11 plans Plantation offers in Dellrose. Homes are designed for spacious 70-foot properties and range from 2,641 to 4,046 square feet with prices from the $310,000s. What’s more is the builder’s signature flexible floor plans allow for easy customization. Beyond your new home in Dellrose and the community’s exciting collection of on-site amenities including the Clubhouse, resort-style pool and parks, you’ll discover a wealth of nearby conveniences including golf courses, the Kleb Woods Nature Preserve, Houston Premium Outlets and the retro Showboat Drive-in. Elevate your lifestyle with Plantation Homes and Dellrose by visiting us today.